Top World Coin Operated Air Hockey ( 2 players) is a high quality Taiwan made air hockey table machine, features with 10mm polycarbonate durable playfield for faster game play, strong and durable aluminum body, it is with awesome chasing LED lights and audio, with overhead digit score board. Which makes the entire table light up with a cosmic glow. 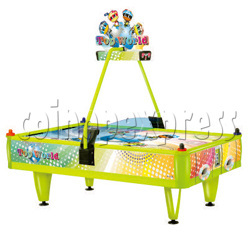 This top world air hockey is with faster fun for excellent skill testing games and it is with unique lighting legs and graphic, it will attract for any player, suitable for kids from 3 years old and all adults.